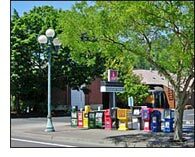 Directory of regional newspapers from around the State of Oregon. The progenitor of this cyber-edition is an old-fashioned newspaper published every two weeks in Eugene, OR. This paper is by the students at the U of O.
Eugene, Oregon's alternative newspaper of news, arts and entertainment. Published every Thursday. The online edition of the Springfield News, Springfield, OR. Read local news and more. Just another Clear Channel recording. Southern Willamette Valley's "Soft Rock Hits". NPR member station with a mix of music and news. Cumulus - "Real Music Variety"
Magic 94 brings you easy listening with Storm Kennedy and crew. Classical music 24-hours a day from the U of O. Punk, Radio theater, Ska, Children's, Hip Hop, Industrial, Metal, and Reggae. With live streaming content. Our favorite local station on the air since Dec 8th 1946. KRVM is operated and staffed by community volunteers and local 4J students. Community Television of Lane County, Inc. in Eugene, Oregon, is a nonprofit corporation dedicated to promotion and support of public access television production. Eugene's CBS station features the Christian teachings of nationally syndicated writer Dr. Dobson and his Focus on the Family spots. Publicly funded by a diverse range of supporters. Hip? programming for all ages. News, sports and weather covering all of the Pacific Northwest.